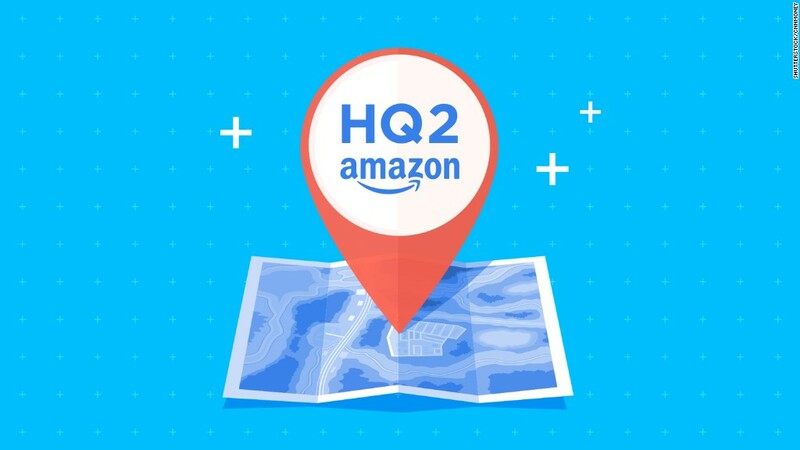 Amazon has narrowed down its hunt for a second home to 20 locations. And the chosen city is likely to get an economic jolt -- particularly to its housing market. The company announced in September that it plans to open a second corporate headquarters, and a nationwide bidding war soon broke out. Some cities offered massive tax breaks, while others got creative with their courtship. Tucson, Arizona, sent a giant cactus to CEO Jeff Bezos and one Georgia town pledged to name an area "The city of Amazon (AMZN)." The second headquarters is expected to cost at least $5 billion and create as many as 50,000 high-paying jobs -- no wonder cities rushed to lay out the welcome mat. The selected city will get an immediate boost to jobs and wages, said Javier Vivas, director of economic research for Realtor.com. It will also push up home prices and lead to new home construction in neighborhoods within commuting distance from the headquarters location, he added. When a big company moves into a new town it tends to have a ripple effect on the local economy: job creation strengthens, some wages increase and home prices rise. Just look at what happened in Reno, Nevada, after Tesla opened a massive battery factory: Home prices have soared 43% since the fall of 2014, following the start of construction on the Gigafactory, according to Daren Blomquist, senior vice president of communications at ATTOM Data Solutions. The same phenomenon occurred when Apple moved its headquarters to a new location in its home city of Cupertino, California. In the three years following the project's approval, homes located within a mile of the new campus appreciated three percentage points faster, on average, than the rest of the county, according to Realtor.com. Just how much home prices will rise in Amazon's chosen city will depend on a variety of factors: the existing inventory, recent home price performance, demand and the space available for new construction. Of the 20 cities, those that have seen more modest home price growth than others on the list stand to gain the most, according to Blomquist. He pointed to Pittsburgh, Indianapolis and Columbus, Ohio, as the markets that could see the biggest gains. "The impact in markets where there has been single-digit appreciation ... we could see a jump, at least in the short term, to double digits of 10%-20% or even more appreciation for the first year," he said. In places where housing is already in limited supply and building regulations are prohibitive -- like New York and Boston -- home values could rise even more with a surge of new residents to staff the new headquarters. For instance, home prices in Boston have jumped 8.4% in the last year to a median home value of $568,300, according to Zillow. If Boston becomes the new home of Amazon, it would be "chaos," according to Fernando Ferreira, an associate professor at Wharton School at the University of Pennsylvania. "The housing market would be three times worse than it already is," he said. Markets with existing inventory and space and fewer obstacles to building will be able to more easily handle the need for new home construction, experts said. The big winners in the chosen city will be current homeowners who will likely see their home appreciation rise when Amazon moves in. "If you are in a larger house and ready to downsize or move, this will be a pure gain for you," said Stijn Van Nieuwerburgh, professor of finance and director of the Center for Real Estate Finance Research at New York University Stern School of Business. Another indirect advantage for the winning city: Rising home values will likely to lead to higher property taxes, which could help boost a city's budget and services. "As property taxes and revenues go up, that can go to schools and improve their quality and better fund programs ... and infrastructure," said Van Nieuwerburgh. On the downside, a big jump in home prices means renters or wanna-be homeowners in the selected city could lose out, potentially forcing some long-time residents out of the city. "If you are a first-time homebuyer in the selected city, this is bad news," said Van Nieuwerburgh. "Property prices will go up and you will have to borrow more."